My CultureGrrl story focused on the details of the staff restructuring and mission changes contemplated by director Carmine Branagan, whom I interviewed at length by phone on Friday evening (but who was unavailable to Miller). I also examined her institution’s finances, which appear not to have been righted by the deplorable deaccessions that she orchestrated in 2008. Miller noted in his piece that the museum’s board had been told that “the reason the employees were let go was financial.” That jibes with what I heard (but did not quote yesterday) from a highly informed source (not one of those fired), who said I could use what he told me but requested anonymity. Branagan had asserted to me that the firings were driven not by finances but by a desire to reorganize and streamline operations. The staff is streamlined and one of the main ways that it’s being drawn together is Maurizio Pellegrin, who was the director of the school and is also an internationally recognized artist and a fantastic educator. He will become the creative director. Under him will be a reorganized school staff and a curatorial staff which has the curatorial pieces headed up by Diana Thompson [formerly the Academy Museum’s associate curator of 20th-century art] and the school pieces headed up by a new hire [Elvin Freytes, formerly director of student affairs, New York Academy of Art], who will be the director of school administration. While deaccessioning may be part of this sad story, it seems counterintuitive for the director to fire the very folks who might stave off future shenanigans. It also smacks of a disturbing trend among boards and administrators who devalue the curatorial role in collecting institutions—turning instead to unqualified amateurs. The promotion of the associate curator does not inspire confidence when she reports to Pellegrin, who claims ultimate curatorial responsibility, comparing himself to Anna Wintour and the Academy to Vogue magazine, among other bizarre notions. 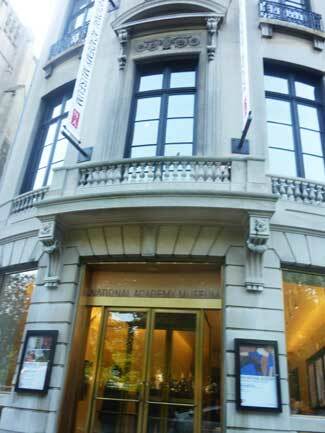 Both [former National Academy curators] Marshall Price [who left in March] and Bruce Weber [one of the National Academy Eight fired on Thursday] accounted for the little credibility that the institution has been able to regain since the deaccessioning debacle. If the museum wanted to focus more on the collection, they should have turned to the people who know it best and have deep scholarly experience with these very artifacts. If the Academy doesn’t want to be a museum anymore, that’s their decision. But eviscerating the museum staff while maintaining the pretense of museum operations is disingenuous at best and an unbelievable betrayal of donors, artist members and other supporters.